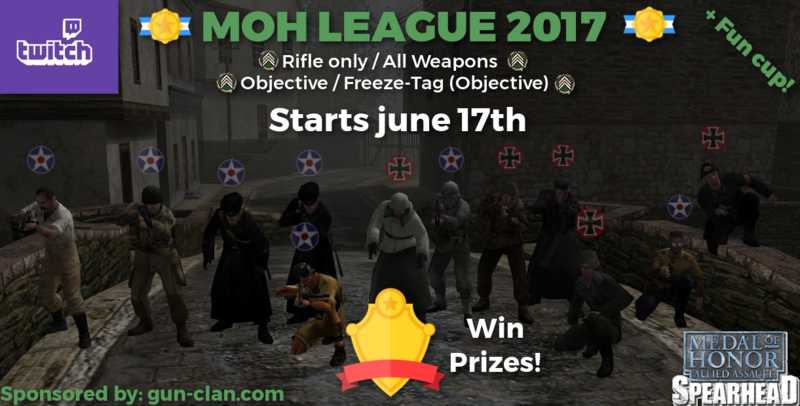 We have recently been getting asked a lot by the public players and as well as some of the remaining clans within Spearhead if we will ever look to re-host the moh:league tournament seeing as the previous two back in 2012 and in 2013 were well organized and notably successful. Supported gametypes in the league are: Objective, Freeze-Tag(Objective) with Rifle only or All weapons. Beside that, we will host a knockout fun cup! In this cup you will be playing with rifles only and steal the enemy their beers! Twitch livestreams will done to support this old game and show the rest of the world that this community is still active! Please share this tournament with all of your MOH friends! Click on the continue button below to sign up for the league! Last edited by Appelpitje; May 27th, 2017 at 09:54 AM.